"Working On Cattle Stations (Ranches)"
More effort, more experience (though there are also many jobs that don't require experience) and more commitment. If you already have experience, like motorbike or horse riding, mechanical skills, driving trucks or graders, then you can register with the big recruitment agencies to find station work. Cattle stations also have many openings for cooks, domestic and gardening staff, governesses and childcare positions. 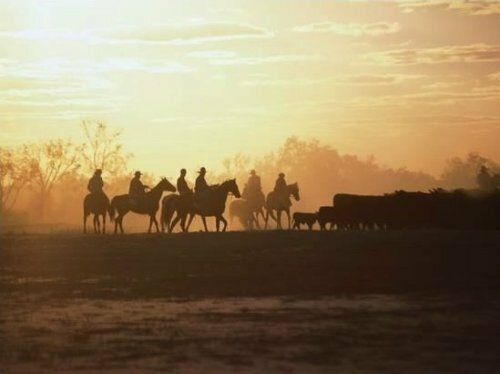 But if you only have vague, and, ahem, somewhat romantic ideas of horse riding in the great Australian Outback, then you better read through this page first. Been in Australia on a working visa or know someone who has? 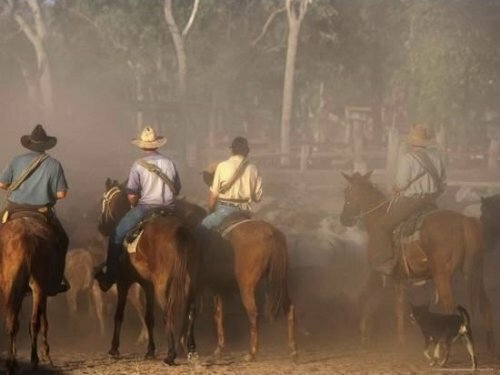 While previous experience helps with finding work in Australia, and is of course always welcome on a cattle station, a good attitude and the willingness to "have a go" are a LOT more important. You will be welcome if you are not afraid of hard work, reliable, enthusiastic and willing to learn. You need to bring a good measure of common sense. Cattle station work is varied and may include anything from mustering cattle on horseback or motorbike, yard work like branding, earmarking and vaccinating, driving trucks, checking water troughs and bores, fencing, repairs, maintenance, cleaning up fallen trees, welding gates... You get the idea. The same is true for any domestic staff on a cattle station, who may have to cook, clean, garden, oversea the kids' home work, give a hand with the muster and yard work... You need to be flexible, adaptable and be able to get along with people. Getting along with everybody and anybody is probably the most important trait you'll need, as you will be working in a close knit team where everybody relies on each other. You need to pull your weight, and there is no room for petty gripes or for whingers. Accommodation and meals are basic, fresh fruit and vegetables are a luxury (meat eaters will love the typical diet on a station) and water may be rationed. You'll be working very long days, from sunrise to sunset, often seven days a week, and the work will be hot and dusty. Oh, and cattle station work is officially the most dangerous job in Australia, with the most injuries and deaths per year. Still interested? Great. You want to find work in Australia, they want to find workers. 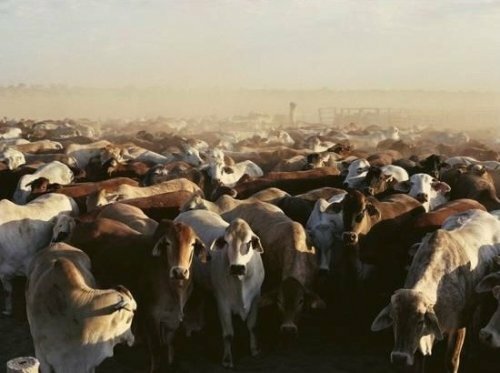 Most Australian cattle stations need good staff badly. Here are some links that will put you in touch with the right people. Take your time looking through them to find the right organisation and job for your qualifications. These are some of the large Australian cattle station companies. The links go to their recruitment/employment opportunities pages. Here are some recruitment agencies that specialise in cattle station and Outback work (some of these may offer training as well). Anna Brown Recruitment might be worth looking at even if you don't have any experience. The Job Shop WA based, works specifically with backpackers, travellers and students. VisitOz offers a variety of courses to prepare you for your new work and will find you a job after completion of training. You can also scan all the usual Australian job search engines. You'd find work on Australian cattle stations under the heading rural/agricultural or similar. You may also want to look at Outback Magazine. Get yourself a recent issue and see what you find in the classifieds. And if you are looking for something very casual, less like real employment, then consider becoming a WWOOFer. Many cattle stations here take WWOOFers.